Lines of unbelivable disciplined aliens are attacking the earth. You have to defend this evil invasion with your laser. 80s styled action game. Lines of unbelivable disciplined aliens are attacking the earth! You have to defend this evil invasion with your laser. But when you survived the first wave, soon the next one will appear. And every new wave is faster then the one before... 80s styled action game. Tamestorm presents a new game, called Air Assault. It is the vertical scrolling shooter. The idea is to fly across different areas and fight with the enemy units in air, earth or water. Keep the spheres out of your goal, with 3 types of games to choose from - timed, countdown, and high score. Have some simple clean fun for between 1-4 players with multiple game options against both human and computer opponents. Once upon a time, evil forces escaped from hell. Powerful magicians had overcome these evil forces and sealed them on a mysterious island. And over where they were sealed off, a church was built, and the seal was protected from being destroyed. put thos parts to a full photo. 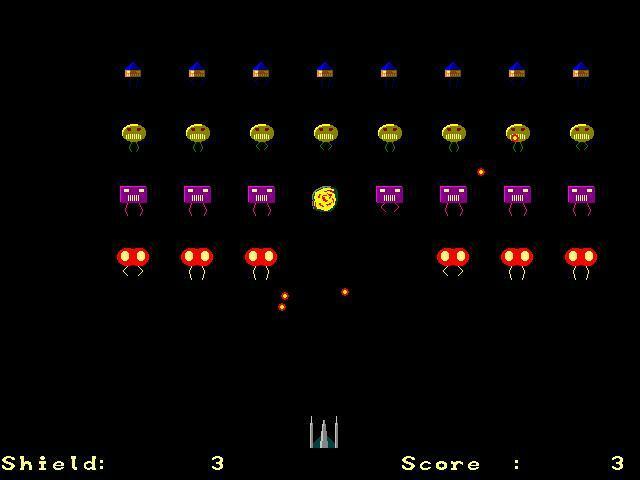 Freeware clone of the famous arcade game. While on the run from the evil Cigarette Ghosts and their minions, you navigate Scynse-Man through several mazes, gobbling all of the pills lying around. There is an Arcade Mode with a high score list. The game immerses players, little people, into world wars. The players are divided into defenders and attackers. The defenders will be at your disposal. Your goal - to prevent the enemy from killing the king while defending against all attackers. Great Challenge Awaits! Let's hope your math skills are on par! You'll need them in order to solve the tough puzzles in this math based challenge! Meet the total sum of the clue numbers in each column but don't use the same number twice!! Zombies are invading your home, and the only defense is your arsenal of plants! Armed with 49 zombie-zapping plants like peashooters and cherry bombs, you ll need to think fast and plant faster to stop 26 types of zombies dead in their tracks. 2D top-view racing game with cartoony tracks, clever drivers and bonuses. You will drive through Inventor Isles, Asteroid tracks and Magma Floods and other wonderful places. For Nokia 5800, Nokia N97, Samsung Omnia HD and other Symbian S60v5 phones. Tripsimus, the fastest snail of all, went in search for the Magic Lettuce to save the animals from starvation. Join him in this wonderful side-scrolling adventure. Features: many levels, seven game worlds, minigames, appropriate for all ages. An action/arcade game with a touch of a puzzle element. Turn on all 4 switches in a Sector without being destroyed by mutant gems. Destroy the mutant gems and protect the white diamonds to maximize your score. This site does not contain serial number, crack, keygen Invaderers serial number : serial number is the simplest type of crack. A serial number(cdkey,product key,etc) is register the program as you may already know. a crack or keygen may contain harmful software. If you cannot find the exact version you want, just give it a try. for more information read .nfo/.txt/.diz file include in zipped file.